Below you will find a list of all the Dingo bonuses - offered to new players. The right side offers a casino overview (click to scroll through the images). Online gamblers are always looking for exciting casinos and in 2018, Casino Dingo started operating, presenting players with a huge assortment of games that are instantly accessed through the web browser. This casino provides a handsome welcome package when players signup and there are many ongoing promotions as well. This licensed and regulated site supports a variety of currencies and payment options and provides access to top rated casino games, including slots, table and card games, video poker, and more. With this 2018 review, players can find out how to get started with the great bonus offers at Casino Dingo and start generating real money payouts. Canadian players will benefit from signing up at Casino Dingo as this site is trusted and secure, offering access to leading games Canadians enjoy. To cater to the needs of these players, the site operates in English and does support the use of Canadian Dollars. There are also multiple trusted banking options that can be used. After a brief interview with the casino manager, we find that many Canadian players are already loyal members of this newer site with the majority of players hailing from Quebec and Montreal. Those who are signing up at this newer online casino will have a great welcome package that is available and this can be redeemed. This rewarding welcome bonus offers a match of 100% on the first four deposits that are made, presenting players the chance to grab up to $1400 in free casino cash. In addition to the match bonuses, players will also collect 140 free spins as part of the offer when they make use of bonus code DINGOFS. Before players can withdraw any amount that has been won using the Casio Dingo bonus, they will have to meet a 30x wagering requirement. 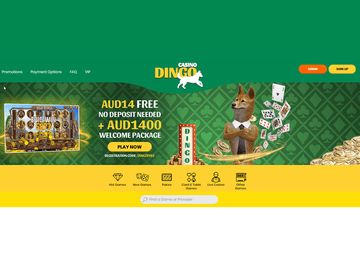 With our review of the site and all of the available bonuses, we find Casino Dingo to lack the offering of a no deposit bonus. All promotions that are featured will require a deposit to be made. However, with the free spins as part of the welcome offer, players can quickly get started with some of the amazing slot games supported. There are some exciting offers for returning players at Casino Dingo and even though players cannot get started with a no deposit bonus, they will find some fantastic deals on hand. Every Monday, there is a weekly cash back offer where players can earn up to 25% on all deposits that are made. There is also a Weekend Cash Back bonus that offers 15% back when players make a deposit to their Casino Dingo account on Friday. Frequent players will be happy to learn that the casino also offers a super Reload Bonus on every deposit that is made to an account. Players just have to deposit between $10 and $100 and they will get a 100% match bonus on any deposit that is made. All members with an account at Dingo Casino will benefit from the amazing Loyalty Program that is in place. Any game that is played with real money will generate comp points and these will be accrued in the account. Once players get a certain amount, they can exchange them for cash. Every $10 that is wagered on games will earn a comp point. Every 100 points collected can be redeemed for $1 in casino cash and there are no wagering requirements in place. There are four tiers to the loyalty program and players will advance as they collect more points. Each tier has added benefits that can include better loyalty promotions, exclusive gifts, cash back offers, personal account managers, and better conversion rated for collected points. 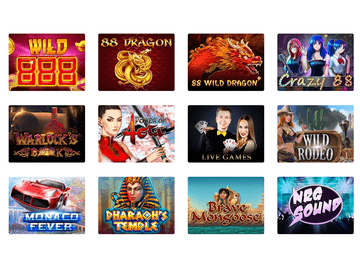 With our 2018 review of Dingo Casino, we found the site to offer instant play games from various software providers. Players can only access games and casino services in English, but with a huge array of games from leading developers, there is much to enjoy. The casino offer titles from Betsoft, Booming Gams, EvoPlay, Mr. Slotty, Felix Gaming, Booongo Gaming, and Fugaso. With a massive assortment of titles, players will be able to enjoy their welcome bonus on top rated games and can play most of the supported titles for free as well. All games are tested on a regular basis and the payout percentages are verified and publicly published. Since this site is geared towards Aussie players, the majority of the games are slots, or pokies, as Aussie players call them. With these games, players will find three and five-reel versions and there are some amazing titles like Fear of the Zombies, Gangster Gamblers, and Chicago Nights. The casino is always adding new game titles, so there will be something exciting upon every visit. At times, there are free spin bonuses that can be claimed that will benefit any slot fan. This site is also home to a great variety of card and table games and players will find some appealing variations of poker, roulette, blackjack, and other classic games. There are also some specialty games like Keno and Fortune Wheel and as one would expect from a top rated site, there are video poker games as well. Casino Dingo also offers a small, but thrilling selection of live dealer games, which include Blackjack, Baccarat, Roulette, and Casino Hold Em. This thrilling online casino also offers a great mobile platform that can be enjoyed by Android and iOS users as well as those with any other operating system. Just as with the main online casino, the mobile casino does not require any download, so games can instantly be accessed through a web browser for on the go fun and excitement. The mobile platform is safe and secure and offers access to all of the popular game titles. Those playing with an Android, iOS or other devices will be able to sign up if they are new to the site and collect the bonus code offering a tiered match bonus and free spins. The mobile site also allows instant access to the casino cashier, so players can always manage their accounts. With hundreds of great games that are designed for smartphone and tablet access, players can always enjoy realistic casino games and have the chance to win when they make use of Dingo Casino Mobile. Conducting transactions at this top notch casino site is safe and simple and to ensure players always have ways to manage their accounts, Casino Dingo supports the most popular payment methods. Many of these can be used by Canadian players as well as those from other locations. When making a deposit, players can choose from Visa, MasterCard, Maestro, Visa Electron, EntroPay, or Neosurf. Withdrawals can also be securely conducted using Maestro, MasterCard, Visa Electron, Visa, or EntroPay. The site does have a $5,000 withdrawal limit each month and after a 5 day pending period, withdrawals will be processed quickly, with ewallets taking 24 hours and credit and debit cards taking from 3 to 5 days. Casino Dingo wants to make sure that all members have a positive experience, so there is amazing support offered. Anyone can contact the support team with questions pertaining to games, bonus codes, free spins, account management or any other gambling related issue. The support team can be reached using live chat, which is the easiest and fastest way to get assistance. There is also email and phone support and the site offers a small FAQ section. Some new gamblers may have some hesitation when signing up at a real money site, so to ease any concerns, this review covers some important FAQs that will benefit anyone that is just getting started. What currencies can be used to conduct transactions? Since Casino Dingo accepts players from many locations, including Canada, there are multiple currencies that are supported. These include Australian Dollars, Canadian Dollars, Euros, British Pounds, Russian Rubles, US Dollars, and South African Rand. Are provided games tested for fairness? Yes. All games at Casino Dingo are routinely tested by Gaming Laboratories International and the RNG is audited. Do all bonuses require the use of a bonus code? At Dingo Casino, players will find a great assortment of bonuses and promotions that can be redeemed. Not every one will require a bonus code, but when these are required, they will be provided on the Promotions page and can be redeemed when players visit the casino cashier. Are there site restrictions based on player location? Yes. This site operates in accordance with local gambling laws, but may not accept all real money players There is a complete list of restricted counters at the site and these include Algeria, Hong Kong, Indonesia, Panama, Singapore, Spain, the United States, United Kingdom, and the Philippines, to name a few. With an exciting welcome package that includes free spins, players can quickly get started with hundreds of games at Casino Dingo. Even though this is a new online site, it has already gained the trust and respect of thousands of gamblers and continues to offer new and exciting games, high paying bonuses and great customer support. Getting started is fast and simple and with the most trusted payment methods offered and multiple currencies, players will quickly see why this site is a top choice in the online gambling world. Our review of this site shows it to be trustworthy and completely secure, offering instant access, tested games, and a super Loyalty Program.